No gimmicks, no amplification; Just genius design. The Yamaha FG-TA (Trans Acoustic) is a mind blowing electro-acoustic guitar which allows you to play normally with a stunning acoustic tone and feel, and then at the touch of a button, transports you sound to a new level with reverb and chorus effects, all coming from the body of the guitar with no amplifier needed. It makes your music sound like its through hundreds of pounds worth of effects and sweet sounding amplification when in fact it is all from the guitar itself. It really has to be played to be believed. When you play an acoustic guitar the reverberation of the sound comes from the environment around you. But, quite often people plug their guitars in to amps and use hundreds of pounds worth of effects to bring the sound to life and get exactly the effect they need. The Yamaha FG-TA requires none of this. there are no speakers in the FG-TA but some very clever electronics that allow the body and air in the guitar to resonate with reverb and chorus effects just as if it was plugged into an amplifier/ effects unit. 2 Dials allow you to instantly add reverb or chorus effect to the sound of the guitar. As if by magic, turn the dials and the guitar can sound like your playing with a beautiful warm room reverberation with chorusing harmonics all emanating from the guitar in your hands. It is something you have to hear and try to believe but it will totally transform your sound, your playing and your enjoyment for playing acoustic guitar anywhere, anytime, without the need to carry around effects and amps to please your ear. There is a third dial on the FG Trans Acoustic guitar which controls the pre-amp output volume to the line out jack on the guitar. So if you want to amplify your performance then you can plug straight in to an amplifier and hear the superior high quality sound of the Yamaha System-70 pre-amp working with the effects for a truly stunning tone. 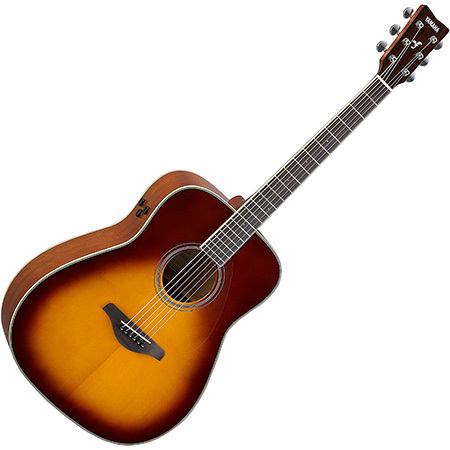 Yamaha have worked tirelessly and used advanced sound analysis to produce a rich, emanating tone from the solid spruce top and mahogany back and sides. Only the best guitar sound can make use of the trans-acoustic technology and so thats what they did. Yamaha developed a bracing design based on years of audio analysis and science of the woods to create a guitar rich in low and and warm mids but have retained the crystal clear highs to make the notes ring with great sustain and clarity of notes. they even re-designed the battery compartment to a single mount where the output jack resides meaning less holes and therefore less acoustic sound loss.